Got job candidates you can’t afford, but you know they’d be a fantastic fit with your business? Don’t be so quick to assume they are out of your reach when you’re thinking about hiring candidates. Say you’ve decided your company needs a superstar engineer, IT professional or C-suite executive to fill a void. If you’re a smaller company of 10, 25, 50 or even 75 employees, chances are it’s going to be tough to compete on salary alone with bigger companies that are able to offer bigger salaries. There’s good news, though. While compensation is important, it isn’t the only way to win over top-tier prospects. Sometimes the promise of extra experience, a shorter commute or a few extra perks can convince high-level recruits that your business is the best place to work, even if it pays less than another company. Before you begin your search for this highly sought-after new employee, it’s important to first figure out the must-have characteristics of this candidate. Do they need to have a certain certification, years of experience or established contacts in the industry? Focusing on fulfilling these characteristics helps you make a more rational decision once you’ve found the right person. Next, consider what makes your company different and what you have to offer besides salary. Then, during the interview process, pay attention to what the candidate says. If their discussion tends to focus on salary and bonuses rather than the work and your company culture, then you must be open to admitting this may not be the candidate for you. After all, it’s likely you will only be able to keep that person 18-24 months at most before they’re lured away by the larger salary they wanted all along. Still, just because a candidate wants a higher salary, that doesn’t mean they’re entirely off limits. Here are five ways to get creative when you’re looking at hiring candidates who normally command higher salaries than your budget allows. Depending on the position and where the person is in their career, you may be able to lure them with a more advanced job title. It can be worth a few dollars to a candidate to get a director or vice president title on their résumé. Some candidates may be at a stage in their careers where fulfillment is more important than money. You may be able to attract such employees with the promise of more control and authority that comes with a more senior title. Keep in mind that you may have to add to the responsibilities associated with this job in order to justify the loftier title to your existing employees. But for a candidate considering the long-term advantages of building their résumé, a higher-ranking title may be just the ticket. These days, employer-sponsored benefits, such as health insurance and retirement plans, are more than a perk — they’re a baseline expectation. They show your employees that you care about their well-being both in and outside the office. Solid medical coverage and the opportunity to save for retirement are the cornerstones of any comprehensive benefits package – and a must for attracting top talent. But a variety of other benefits can often help tip the scales in your favor with job candidates you can’t afford. For example, the opportunity to work remotely is growing in popularity, a trend that shows no signs of slowing. You also might consider offering additional paid time off, a company car, profit sharing, a shorter vesting period, or a bonus tied to company performance. Access to technology can be another important draw. While a company cell phone and laptop are practically standard with larger companies, not every company can say that all their processes are online. Most job candidates will appreciate a prospective employer who offers the convenience of online, self-service access to things like their timesheets, paystubs, benefits information, performance reviews and more. For some employees, a positive company culture is more enticing than competitive compensation or benefits. As you talk to candidates about what is most important to them in a job, sell them on what will appeal to them about your company culture. That may be your dedication to work-life balance, potential for rapid professional growth, or your company’s community spirit. For example, some candidates may want to work for an entrepreneurial company that’s projected to sell to a bigger firm or go public in three to five years. They want the opportunity to work in a startup culture and may be willing to take a lower salary for that experience. Highly talented candidates often have multiple companies vying for their attention. They can afford to be choosy about where they work. Spotlighting your culture can help you get noticed and beat out the competition when hiring candidates of this caliber. Hard-working, highly competitive candidates aren’t just looking for a job – they’re looking for opportunities to increase their skills and advance their careers for the long term. By touting your management team’s experience, you’re telling potential candidates that they will have the opportunity to learn from people who are well respected in their fields. Particularly in technical fields, you may be able to entice a young engineer with the promise of being supervised by a senior engineer who already has their P.E. license, which in turn may help that person qualify for their own license sooner. In yet another example, some IT professionals deliberately seek the chance to work for a startup guru. They want to be mentored by an industry leader so they can learn at the feet of a master before going out on their own to start their own company. You may be able to attract candidates with the promise of working with a well-known expert, or working on a special, high-profile project. After all, it’s a tried-and-true career formula to work for a successful senior professional in order to burnish your own qualifications and credentials. In most cases, top-performing professionals are always striving to develop their careers. They don’t want to be stuck in the same job forever. That means selecting a company with potential advancement and promotion opportunities is a must. If your management team came from a similar background as the candidate and grew with the company, be sure to talk about those experiences during the interview. This will show them that there are opportunities for growth and that your company believes in promoting from within. Another option: Offer to pay for a candidate’s professional certifications or advanced training. Particularly if the candidate currently works for a larger organization, it may appeal to them that they can work across an entire project rather than being siloed, as is typical with a big company. Your potential employee may find it attractive that they can work on every phase of a product from concept to testing through launch. But be aware: While candidates want recognition and appreciation for their work, there comes a time when words are not enough. Eventually, you’ll have to follow through with a promotion or growth opportunity. If you don’t, there’s a good chance they’ll look elsewhere. Remember, not everyone wants to work for a large company. Your smaller organization may be just the ticket for some candidates, so don’t assume you can’t compete with big business when hiring candidates who seem outside your budget. You shouldn’t give up on a candidate who wants a higher salary than you have budgeted. Think about what makes your company different from the competition and sell the candidate on it. Want to win over first-class candidates? 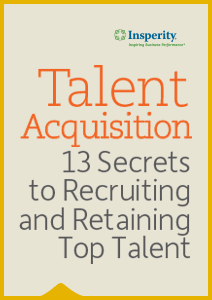 Download our free e-book: Talent acquisition: 13 secrets to recruiting and retaining top talent.